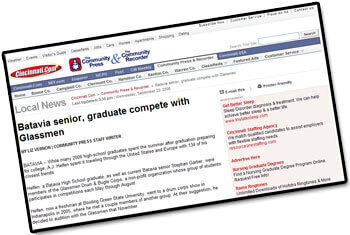 The Cincinnati Community Press newspaper recently featured two 2006 Glassmen members. A.J. Helfen, a graduate of Batavia (Ohio) High School, and Stephan Garber, a current senior at the school, were interviewed about their summer tour of Europe and the United States with the Glassmen. Check out the article on news.communitypress.com.